Lock in your DirecTV savings for 2 years! Get everything you want in TV entertainment and sports. Big entertainment. Even on small screens. Enjoy a seamless experience from your TV, to your phone, tablet, or computer1. Stream over 100 channels live including ESPN, Fox News Channel, ABC, and more. Watch thousands of titles On Demand. Even watch your DVR recordings2. Every out-of-market game, every Sunday. Only on DIRECTV. 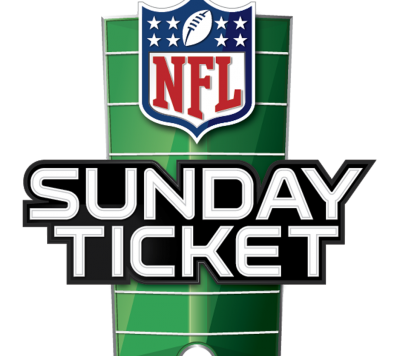 Don't miss another game with the 2015 season of NFL SUNDAY TICKET MAX included at no extra charge. Get live games on your phone, tablet, or computer3. Watch multiple games at once on our Mix Channels4. See every score on the Red Zone Channel, and so much more! *REQUIRES CHOICE™ PACKAGE OR HIGHER. INCLUDES 2015 SEASON. OUT-OF-MARKET GAMES ONLY. 24-MONTH AGREEMENT REQUIRED. Genie. Advanced HD DVR system. With DIRECTV you can put your TV anywhere. No more drilling walls and woodwork. Forget about recording conflicts. Genie records up to five shows at once—any time, any channel, in glorious HD6. Start watching a show in your living room, pause it, and pick it up anywhere else—even in your backyard5. 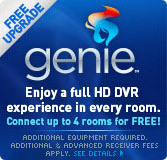 What do I need to enjoy Genie in every room? Our most advanced HD DVR ever. Record five shows at once, store up to 200 hours of HD programming, and much more. Genie Minis can deliver the full HD DVR experience to any room in your home. Connect up to eight to a single HD DVR. Choose Wireless Genie Minis. They connect to the Genie HD DVR via Wireless Video Bridge. No cable outlet needed—just the power cord and an HDMI cable. FREE professional installation plus save $20 with FREE handling. Online Only! LIMITED TIME Lock in 2 years of savings! Save $35/mo in your 1st year AND $10/mo. in your 2nd year! NO redemption required. LIMITED TIME Lock in 2 years of savings! Save $36/mo in your 1st year AND $10/mo. in your 2nd year! NO redemption required. LIMITED TIME Lock in 2 years of savings! Save $38/mo in your 1st year AND $10/mo. in your 2nd year! NO redemption required.